Over the past few years, as I talk to people about living a more healthier lifestyle (especially concerning food), the number one statement I hear is..
It’s a struggle we all deal with. Wanting to be healthier, but just lacking the information or the know how to get there. You start out with good intentions, but then fall back into old habits when it gets hard or things don’t seem to be progressing the way they should. I wish I could say I had a ‘miracle solution‘ to help you be healthier, but to be honest, it’s a choice we all need to make and stick to. OK. Well, if you’re still reading up to this point, I’m going to assume that you have made the choice to be healthier. Whether that means you just want to learn more about what a Plant-Based diet is all about or you’re ready to take on the full 30 Day Challenge.. I’m glad you’re here. I am not a physician, nutritionist, and or dietitian. I am an Integrative Nutrition Health Coach who has a passion to help people find what makes them happy and healthy. With that being said, any information I share with you today is just what I have found to help me. As with any change of lifestyle, always consult your own personal physician before making drastic changes. First Things First.. What Does Plant-Based Diet Mean? Various organizations and groups have different definitions of what ‘plant-based’ means. In The Not So Perfect Housewife terms, a plant-based diet is a diet based on foods derived from plants, including vegetables, whole grains, legumes and fruits, but with little or no animal products. This can also include no oils of any kind. Each opinion or thought of what to include and not to include in a plant-based diet is just that, opinions and thoughts. Yes, some are backed up with scientific data, but when it comes down to it – do what works for you. For me, I still use oil. Not a TON. And when I do, I try to use good, healthy oils like avocado and coconut (yea.. I said it.. coconut is healthy.. in my opinion). This is what works for me. You know.. it’s not really a challenge. It’s a “You Can Do This” type incentive. For me, it’s more about giving you a bunch of my favorite recipes, from some of my favorite chefs and bloggers, and showing you that YOU TOO can eat a plant-based diet and feel better for it. Starting on the first of any month maybe be the easiest for you. But if you want to have fun or just be a little different and start in the middle of the week, in the middle of the month.. go for it. And now that you’ve got the cool printables… on to the recipes. Now before you look over the list and send me comments that there are only 15 of each.. let me explain why. One way to almost assure victory in a new challenge or lifestyle change is to make it simple. Using a recipe twice in one month not only allows you to save time and money (buying in bulk and batch cooking), but it also keeps you from getting overwhelmed by ingredients and the thought of cooking 30 new recipes. You can also add in your own recipes. Find one on Pinterest you like? Add it to your menu. Always be open to shaking things up or cooking the same thing two or three days in a row. We all have those days come when you don’t feel like making something new, so be flexible. Oatmeal is my jam every morning. I’m eating my oats just about every day.. if it ain’t broke.. why fix it. Using one recipe over and over can actually be a good thing. I have pulled together some of my favorite recipes from chefs and other bloggers I follow. There are some really talented recipe creators out there that love their plants, so take advantage of that. Mix em up and place them where ever you want in your 30 days. Have fun with it. Easy Substitute – there may be some recipes that have things like regular milk in them. Just replace the regular milk for a nut milk or soy milk of your choice. There you go. 15 meals for Breakfast, Lunch, and Dinner. Take your pick of what you’d like to implement and make that menu plan. Don’t be nervous. Have fun with this. Have fun in the kitchen. You’re going to do great! I LOVE reading your comments and questions, so please feel free to leave me a comment here or use the email link on the sidebar to contact me directly. I’d be more then happy to help! You can find these recipes and others on my 30 Day Plant Based Challenge Pinterest board. Follow along. Love this challenge idea! And I definitely agree with the importance of planning! Thanks Abbey! Yes, planning is a must to make something work well for sure! This is my kind of plan! I love all things plant based 🙂 Yum! Thanks Liz. Hope you are able to find some new recipes in there. I love the memes in your post! And this menu plan is amazing! Thank you! Thanks my friend. Maybe you can find something yummy to try while out on the road. Bahahaha I’m literally hysterically laughing at that oatmeal photo. I’m not vegetarian and do enjoy meats, but I also try to make several of our dinners plant based each week. There’s so much value in eating plant based meals! Ha ha. Thanks Chrissy. I know. The oatmeal bowl crust happens to the best of us. LOL! 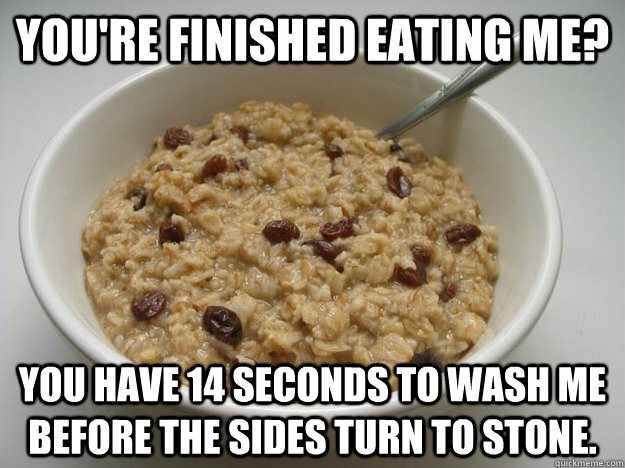 Hahah that oatmeal photo is sooo funny. I still can’t stop laughing. Well this challenge is great idea. With manu plan and grocery list… sounds easy to follow and doable. Thanks for sharing it Deborah. That’s awesome that you’re helping walk someone through a change like that. And yes, it can be very overwhelming. This is such a great way to ease people into going meatless – so many different awesome recipe ideas!! I need to give the vegan tuna salad a try! Sounds pretty awesome! Thanks Ilka. That’s what I was aiming for. A way to kick start a new eating plan for someone. A challenge is how I started a plant based diet. It’s been years and I’ve never looked back. Me too Jill! I love eating all the veggies and plants I can!